One of our key objectives is to help Asian Americans succeed in our industry. And in the spirit of promoting success, we will be announcing ACP’s 2018 scholarship recipients! Our featured speaker is year is V. Fei Tsen. As a developer and public official with experience in the nonprofit, public and private spheres, Ms. Tsen has more than 30 years of experience in building housing at all levels of affordability, civic projects, and large scale, mixed use developments. Ms. Tsen is the President and CEO of Windflower Properties, a multi-family residential development company and President of Tsen & Associates, a real estate advisory firm. She was the Director of Real Estate for the Port of San Francisco, the Director of Redevelopment for the City of Emeryville, and a Commissioner of the former San Francisco Redevelopment Agency. She is currently President of the Treasure Island Development Authority that oversees the design and construction of infrastructure, streetscape, parks and open space for the former naval military base. Her expertise and leadership were critical in finalizing the design and financing for Yerba Buena Gardens and re-envisioning the San Francisco waterfront after the demolition of the Embarcadero Freeway. She has served on numerous Boards for arts, education and nonprofit community development organizations. Ms. Tsen was a recipient of the prestigious Loeb Fellowship, which the Graduate School of Design at Harvard University awards to outstanding designers and leaders who make our cities and natural environments more vigorous and sustainable. This year's celebration will be held at Hong Kong Flower Lounge, which has been part of a fine dining landmark for over 20 years. It is renowned for its sumptuous Dim Sum lunches and fresh seafood specialties, with a balance between traditional and contemporary Chinese dishes. 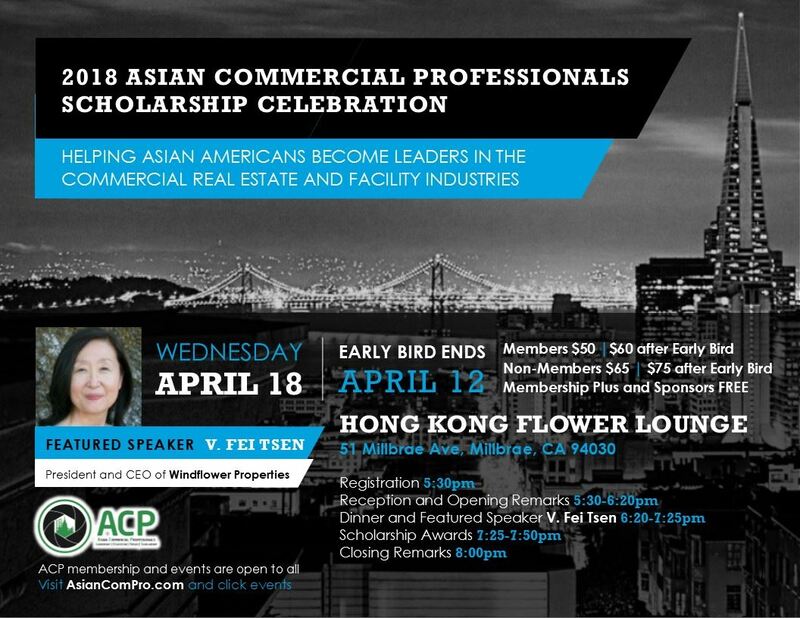 Register now for one of ACP’s premier annual events and show your support of our next generation of Asian American leaders in our industry!